I’m not a huge believer in blindly following ‘wedding trends’ at the exclusion of your own taste and dreams for your wedding. You definitely don’t need to be a sheep! But, at the same time, it’s always nice to know what is up and coming in the world of weddings. For that reason I thought I’d run through 4 of the main wedding invitation trends that look to be a feature of 2017. Overall, I think the key message is that a more streamlined and modern look is beginning to take over from the rustic and vintage vibes that have dominated the last few years. Let’s take a look shall we?! Metallics have been a feature of weddings for a couple of years now and thankfully they show no hint of going anywhere soon! However, what looks to be more in style in 2017 is mixing metallics in a number of different ways. That could be mixing lots of metallic hues together – from copper to rose gold, brass and beyond. 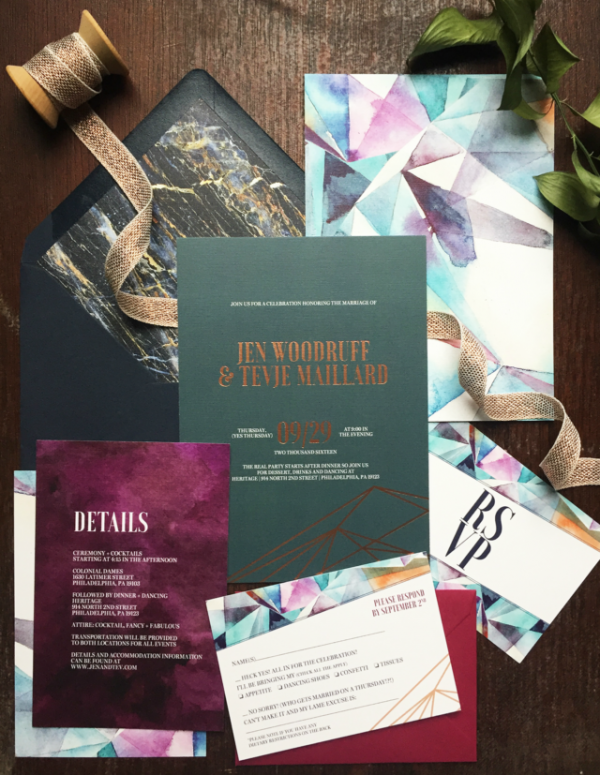 Or, like the gorgeous stationery suite pictured below that could be using metallics to offset other elements like watercolour or geometric shapes. Taking a leaf from interior decorating, mixing styles is very ‘in’ darling! One of the cheapest and most effective ways of decorating your wedding venue is to use masses of seasonal green foliage. 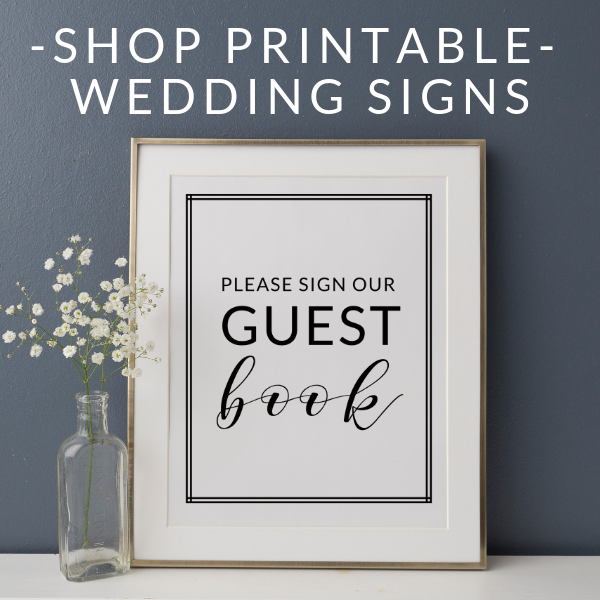 This can be crossed over into wedding stationery very easily! 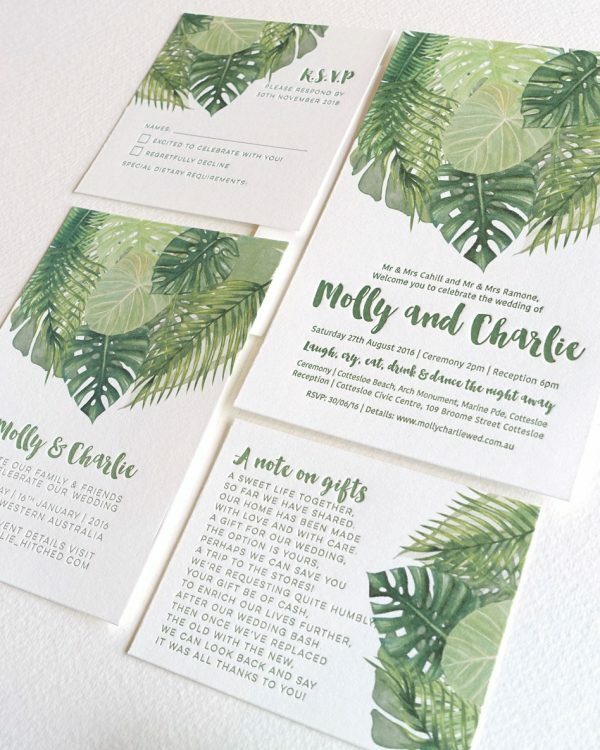 Tropical foliage is definitely cropping up more and more – it looks fantastic gracing your wedding table centrepieces and just as good on your wedding invitations as the examples below show! This works with a more traditional calligraphy vibe as seen above, or with a more modern twist in the below example. Floral wedding stationery has been a trend forever in so many guises. I think the difference in what we’re seeing more of for 2017 weddings is floral with a modern ‘twist’. Sharper lines and prints are a feature of the gorgeous save the date above from Venamour. With plenty of white space and a block black text, it’s pretty with a masculine edge. And watercolour certainly isn’t dead as seen in the suite below. The use of more modern type lifts it from the usual pastel and feminine style. Weddings more and more are taking inspiration from the world of interior decor. And marble has certainly been a huge trend in home decor for a while. It translates perfectly to wedding stationery – looking especially good mixed with a pop of metallic text! And you don’t have to stick with grey marble, the pink and purple marbled stationery below shows how feminine calligraphy stationery can be given a more modern twist and, again, is a bit of a change from watercolour! So, there you have it. Four trends which look to be pretty huge for wedding stationery (and wedding decor overall) in 2017. As I said at the start – I would never want anyone to think that they have to follow wedding invitation trends to the letter. Just take ideas from what inspires you and add your own twist. That way you’ll have a unique and stylish wedding day all of your own! Right – I’m off to finish off some of the Christmas goodies left in the kitchen. 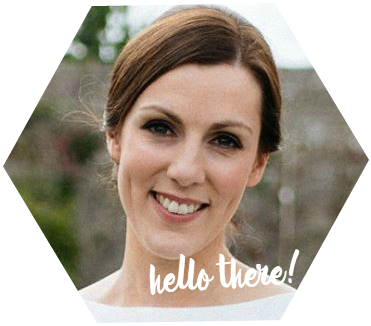 Wishing you all a very Happy New Year – I’ll see you all in 2017!